When I asked my mom if I could write a letter to Gatorade, the first thing she said was that they get a lot of letters and I couldn’t be upset if they didn’t answer. Because I had said something about the commercial many times, I had to think about it like maybe someone would read and remember something in my letter. If I didn’t get one back, I couldn’t get mad. Well, I got a letter back! I am so happy and it was an AWESOME letter and better than that, they said I could share some information here. There are some cool programs Gatorade has that you may not know about and my mom added links to them in case you want to check them out. As I hope you can imagine, there are so many, in fact too many, deserving and exciting sports and athletes we’d like to highlight in our advertising as well as have a Gatorade presence on the sidelines. Although that’s impossible from a resource perspective, I can assure you that we’ll keep your comments in mind as we plan programs going forward. Gatorade is a longstanding partner of the Women’s Sports Foundation, dedicated to advancing the lives of girls and women through sports and physical activity. 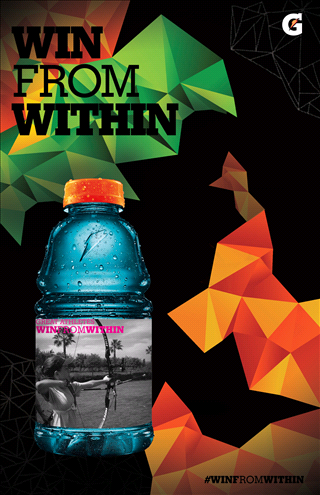 Gatorade has played a major role in elevating that mission through programs we support such as “The Travel and Training Fund” and “Keep her in the Game.” The Travel & Training Fund provides direct financial assistance to aspiring athletes – in individual and team sports – with successful competitive records who have the potential to achieve even higher performance and rankings. These grants allow serious female athletes a chance to fulfill their potential on the regional, national or international level. Girls in the Game not-for-profit organization provides and promotes sports and fitness opportunities, nutrition and health education and leadership development to enhance the overall health and well-being of girls. Gatorade, a division of PepsiCo, has been a strong supporter of Girls in the Game since the organization’s inception 17 years ago. PepsiCo has been their top (“Champion”) corporate sponsor for several years. Hopefully, these two examples, as well as the numerous female athletes we sponsor across a variety of sports, demonstrate our commitment to promoting and supporting women in sports here and abroad. What I learned most from this is always ask questions. You never know when someone will answer with something amazing! Now, who can help me do an archery clinic for Girls in the Game? HOW COOL WOULD THAT BE?!?! I have been asking mom for a while to help me send a letter to Gatorade. Last night she got me the email addresses for some of the company executives and this morning I sent my letter. Because I have so many followers that are girls, I thought this was important to do. If you have time to share, I hope you will spread it around to increase the chances of them actually reading it. I am writing this letter because your commercial “Win from Within” for Gatorade Frost. It doesn’t include more than one woman or archery as one of the sports. Being 13 and a female dedicated to archery, I can say I believe archery is the most mental sport; which is what Win from Within really means. I also got my mom to help me make a poster on your site to put on www.recurveemma.com It made me sad that you don’t have anything archery related for a background but so many other sports are represented. Archery has become a more popular sport because of recent movies like Hunger Games, Brave, Avengers and TV shows like Arrow and Game of Thrones. During the London Olympics, archery coverage was one of the most popular sports watched and NBC said it had approximately 1.5 million viewers. Archery is a very difficult sport mentally and physically. To be dedicated to archery, you have to be dedicated to training both mentally and physically. Physically for archery you have to have upper body strength, lower body strength, strong core muscles and endurance. To be successful in archery you have to have mental strength and that is the hardest part. You have to not get upset no matter where your arrow hits you have to stay positive. You have to repeat the exact same cycle every time mentally and physically or the arrows will not be consistent. Mentally you have to tune out everything that surrounds you: the sun, the wind, negativity, where the arrows hit and people. In archery you have to be in your zone no matter what. I think you should also include Robin Roberts in one of your commercials because of what she just powerfully overcame. She is a role model for females in every sport. She just won the ESPY for her courage. Thank you for taking the time to read my letter and I hope you take it into consideration.